Patients visit their physician/advanced practitioner when they are most vulnerable, and they need to have trust and confidence in their physician/advanced practitioner, especially when they discuss some of the most intimate details about their lives and families. However, when it comes to the physician/advanced practitioner-patient relationship, the two parties are not always aligned. “Often physicians/advanced practitioners don’t understand what their patients want from them. It’s really quite simple — what matters most to patients is to be respected and listened carefully to by their physician/advanced practitioner,” says William Maples, M.D., President and Chief Executive Officer of The Institute for Healthcare Excellence (IHE). When physicians/advanced practitioners build a trusting relationship with patients, it ultimately improves outcomes. On average, 50 percent of patients treated for chronic disease do not take their medicine as prescribed, a study on the success of high blood pressure treatments reported. And many times, that decision to take or skip a dose is significantly influenced by the physician/advanced practitioner-patient relationship. Here are ways to improve the physician/advanced practitioner -patient relationship, according to Dr. Maples, who has worked with some of the nation’s top hospitals on these very efforts. 1. Understand how patient experience impacts quality, safety and efficiency. Hospital leaders need a deeper understanding and awareness of the impact that patient experience has, both on patient experience scores and the culture of the organization. “Achieving excellence in patient experience is more than achieving a top score or top reimbursement through initiatives such as Value Based Purchasing. It’s really about how we show up to work each day and the conversations we have between our patients and each other,” Dr. Maples says. 2. Transform the care model from a provider-centered approach to a patient-centered, team-based approach. Although physicians/advanced practitioners and caregivers work in teams, each and every decision is often made without consideration of the patient’s perspective. According to Dr. Maples, putting the patient at the center of every decision will improve their experience, as well as their outcomes. 3. Provide an experiential skills-based learning platform. Learning in a skills-based format, where physicians/advanced practitioners and caregivers are actually practicing skills they need and use daily, can position a healthcare organization for improvement on all levels. Without addressing these foundational skills, Dr. Maples says an organization’s transformational journey will be slow and ineffective. 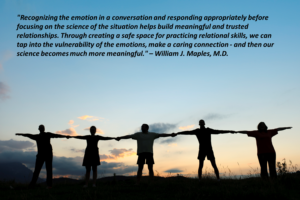 The key to successful culture transformation, says Dr. Maples, is identifying physician leaders who support the effort to rekindle relationship-based tools. Once identified, train them to facilitate skills-based work with their colleagues to enhance the entire team’s journey. Respected physician and allied health facilitators creating a safe place to practice, and nurture relationships enhances the learning and helps incorporate these skills into everyday conversations. “There is no shortage of physicians/advanced practitioners and caregivers who are willing to help improve the physician/advanced practitioner-patient relationship, as long as they know that leadership embraces the work and there is a commitment to supply the resources needed to do the work. We just have to nurture that and bring it forward,” Dr. Maples says.